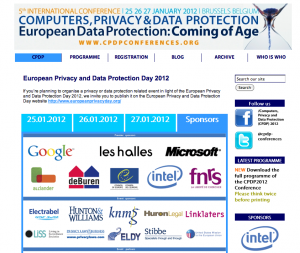 Eldy participates to CPDP – Computers, Privacy and Data Protection, the greatest international conference dedicated to the theme of computer, privacy and data protection in the age of Internet. The conference takes place in Brussels from 25th to 27th Jenuary 2012 at Les Halles de Schaerbeek and the participants are the most important european and international experts of privacy and data protection. To know more about it and receive detailed information please click here.